Downblast Roof Exhaust Fans include both direct drive and belt drive options. Direct drive for short, low resistance duct work with average air volume requirements. Belt drive for average resistance ductwork and high volume requirements. High pressure option for long ductwork with high resistance. Exhaust flows out and downward toward the roof surface. Suitable for roof-mount applications exhausting relatively clean air. All quotes include fan and roof curb submittals for architectural review and approval. 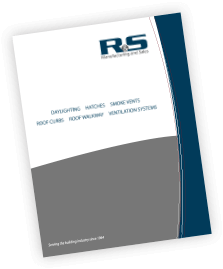 Roof curbs are provided by R&S and will fit any standing seam, R-panel or corrugated metal roof system. Curbs for built-up roofs also available. Curbs to include damper shelves and vibration isolation rails per project specifications. R&S also offers stationary or operable intake louvers for exhaust fan make-up air. Fans, curbs and louvers can include a custom finish to match the building color. Note: R&S offers a full range of Greenheck downblast roof exhaust fans, some may not be shown below. Call or email R&S for more information. Other options: backdraft dampers, speed controllers, disconnect switches, custom coatings and more. The model G is a direct drive, spun aluminum fan, designed for roof mounting on a curb for general, clean air exhaust applications. Units feature a spun aluminum housing and have certifications including seismic, high wind and hurricane. Use this belt drive centrifugal roof exhaust fan for general clean air applications where the air discharge is downward, toward the roof surface. The GB features a spun aluminum housing. Model LD is a direct drive, fabra hood-style fan, intended for roof-mounted applications exhausting relatively clean air, where height and aesthetics are a concern. Units feature a backward-inclined aluminum wheel, with a low silhouette housing. 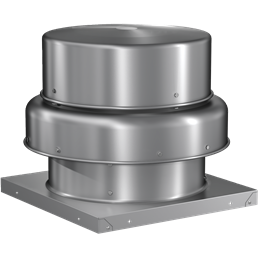 Model LB is a belt drive, fabra hood-style fan, designed for roof mounting in clean air exhaust applications, where height and aesthetics are a concern. The units feature a backward-inclined aluminum wheel, with a low silhouette housing. 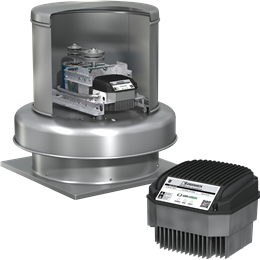 Model 100: Vari-Green Drive to be a factory mounted and wired variable frequency drive compatible with induction motors. Drive shall be factory programmed to match the characteristics of the fan and motor on which it is installed. Operation shall be controlled by an on-board dial, 0-10V input signal, 4-20mA input signal, or other Vari-Green Controls. System shall include appropriate terminal connections for a 24VDC motorized backdraft damper. Parameters of acquainted motor shall be factory set and include but not limit to voltage, speed, FLA, acceleration/deceleration time, and minimum & maximum motor frequency. Drive shall be equipped to mitigate harmonics to levels in compliance with IEEE 519 without the use of external reactors or filter. Internal circuitry shall be UL recognized and accept 3 phase input at voltage ranges of 208-240V or 380-480V. Physical enclosure of the drive shall maintain a minimum of a NEMA 4X rating. Drive status communicated through LED indication for power, run, and fault. Model 100+: Vari-Green Drive to be a factory mounted and wired variable frequency drive compatible with induction motors. Drive shall be factory programmed to match the characteristics of the fan and motor on which it is installed. Operation shall be controlled by an on-board dial, 0-10V input signal, 4-20mA input signal, Modbus/BACnet communications or other Vari-Green Controls. System shall include appropriate terminal connections for a 24VDC motorized backdraft damper and control power, 4 digital inputs, 2 digital outputs, and Bluetooth connectivity with a companion app for mobile devices. Parameters of acquainted motor shall be factory set and include but not limit to voltage, speed, FLA, acceleration/deceleration time, and minimum & maximum motor frequency. Drive shall be equipped to mitigate harmonics to levels in compliance with IEEE 519 without the use of external reactors or filter. Internal circuitry shall be UL recognized and accept 3 phase input at voltage ranges of 208-240V or 380-480V. Physical enclosure of the drive shall maintain a minimum of a NEMA 4X rating. Drive status communicated through LED indication for power, run, and fault and also via the Vari-Green Drive companion app or BACnet/Modbus. Motor to be an electronic commutation (EC) motor specifically designed for fan applications.AC induction type motors are not acceptable. Examples of unacceptable motors are: Shaded Pole, Permanent Split Capacitor (PSC), Split Phase, Capacitor Start and 3 phase induction type motors. Motors shall be permanently lubricated with heavy-duty ball bearings to match the fan load and prewired to the specific voltage and phase. Internal motor circuitry shall convert AC power supplied to the fan to DC power to operate the motor. Motor shall be speed controllable down to 20% of full speed (80% turndown). Speed shall be controlled by either a potentiometer dial mounted on the motor or by a 0-10 VDC signal. Motor shall be a minimum of 85% efficient at all speeds. Control to be a packaged indoor air quality control designed to regulate fan speed based on level of temperature and/or relative humidity in a space. Control shall include a Proportional Integral Derivative (PID) feedback loop and shall have labeled terminal strips for easy wiring. Fan shall be direct drive including an electronic commutation (EC) Vari-Green Motor. Control package shall be Vari-Green Indoor Air Quality – Temperature / Humidity Control. Control to be a packaged Indoor Air Quality control designed to regulate fan speed based on level of VOC concentration in a space. Control shall include a Proportional Integral Derivative (PID) feedback loop and shall have labeled terminal strips for easy wiring. Fan shall be direct drive including an electronic commutation (EC) Vari-Green motor. Control package shall be Vari-Green Indoor Air Quality – VOC Control. Control to be a packaged constant pressure control designed to regulate fan speed based on demand. Control shall include a Proportional Integral Derivative (PID) feedback loop and shall have all components prewired to labeled terminal strips for easy wiring. System shall include the appropriate pressure tap and preset pressure transducer. Fan shall be direct drive including an electronic commutation (EC) Vari-Green motor. Control package shall be Vari-Green Constant Pressure Control. Indoor installations shall include pressure tap (duct or room) and control box with integral pressure transducer. Outdoor installations shall include duct pressure tap, pressure transducer, and control box. Control box shall be pre wired and in a NEMA-3R weather tight enclosure for mounting outdoors near the fans location. Two Speed control shall be a Vari-Green Control specifically designed to allow the Vari-Green Motor to operate at two discreet speeds. Two Speed control shall include two dials that may be set at any point between 0 and 10 volts DC and an integral transformer capable of reducing 115/208-240 volt AC power to 24 volt AC power. Contact R&S for more information on selecting the right equipment for your project. See the Greenheck Fan Selection Guide for an overview of the wide array of products available. Models G (direct drive) and GB (belt drive) are spun aluminum fans designed for roof mounting on curbs for general exhaust applications with relatively clean air. Wheels are backward inclined (non-overloading) and are available in standard and high pressure designs. Motor and drive frame are mounted to the fan on double studded isolators for true vibration isolation. Capacities up to 42,000 cfm or up to 3 in. wg. These fans are designed for exhausting general clean air where height and looks are a concern. The housing is a low silhouette style with interlocking rib construction, providing superior strength. Formed channels adjacent to the ribs provide water drainage to ensure weather tightness. 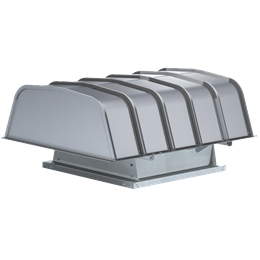 Hoods have hinged galvanized steel supports for service access. Capacities range from 100 to 37,500 cfm and up to 2.0 in. wg. The electronically commutated (EC) Vari-Green (VG) Motor combines motor technology, controllability and energy-efficiency into one single low maintenance unit. Motors are available in sizes ranging from 1/10 to 2 hp and extended RPM motors in ½ and ¾ hp. 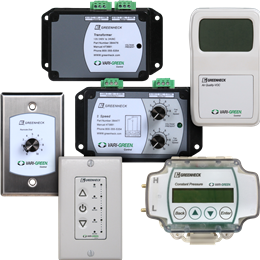 Greenheck’s Vari-Green® controls maximize ventilation system efficiency in a wide variety of applications. 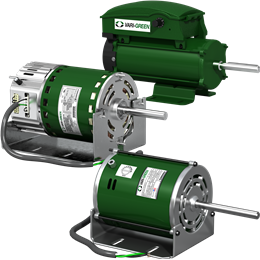 Paired with a Vari-Green motor, compatibility issues are eliminated and installation is greatly simplified. These controls are designed to meet the needs for manual and automated demand controlled operation. The Vari-Green® drive is a factory mounted and wired, pre-programmed variable frequency drive, expanding demand control ventilation to more applications than ever before. With a NEMA 4X enclosure and advanced motor protection, the Vari-Green drive ensures longevity and efficient operation of any ventilation system. VGD-100: The VGD-100 meets the challenges faced in achieving the best performance possible in today’s commercial ventilation systems. For applications where a Vari-Green motor isn’t an option, the Vari-Green drive offers the convenience and benefits of a factory-mounted and wired variable frequency drive. VGD-100+: The VGD-100+ expands on the features available with the VGD-100. Model VGD-100+ has more inputs and outputs that are configured using the free Vari-Green Drive companion app. This drive is also equipped with BACnet and Modbus communication capabilities to integrate into building management systems.